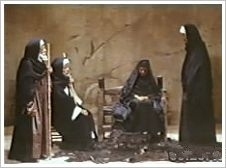 Already in 1969, Shadi Abd al-Salam (1930-1986), Egyptian film director, screenwriter and set designer, directed this film which is universally recognised as one of the greatest Egyptian films ever made. 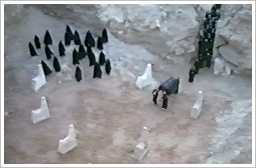 El-Mumia is based upon the true story of the discovery of 40 Royal Mummies (TT320) in the Theban Necropolis near the village of Qurna in 1881. The film takes 102 minutes and has been elaborately restored in 2009 by Martin Scorcese's World Cinema Foundation. Since then it has been presented at numerous film festivals - as today at the Luxor African Film Festival. The Horabat mountain tribe, one out of three families living in Qurna, had found the cache of the mummies long time ago and kept its secret from generation to generation. Selling the artefacts at the antique black market was a good regular income. But the Antiquities Department in Cairo under the direction of Gaston Maspero noticed several objects bearing royal names from the 21st dynasty and sent archaeologists to Thebes in order to find the tomb where the objects came from. Finally, conflicts and murder within the clan led to the betrayal of the secret cache by a clan member to the authorities. The camera work has a low ceremonial speed, the pictures need only a few colours, the score by Mario Nascimbene remains emphatically monotonous. Also the fact that the Qurnawwis speak best classical Arabic creates a surreal atmosphere. Scenes are the Theban Hills as well as the Mortuary Temples of the West Bank (Ramesseum, Medinet Habu) - not only because of this an absolutely worth watching film! You may download it with English subtitles in separately shown files from Internet Archive. Yes, right: the third. Up to now two Colossi of Memnon, 18 metres in height, stand guard at the entrance to the Mortuary Temple of Amenhotep III at Kom el-Hettan on the Luxor West Bank. 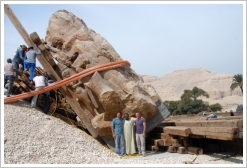 Last Monday a third quartzite statue, 15 metres in height and 250 tons in weight was re-erected about 100 metres behind the two known statues. 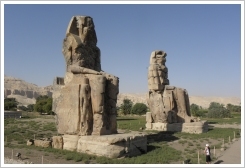 The third colossus of Memnon is part of a couple which collapsed and broke in many parts during an earthquake about 1,200 BC. In 2002, the fragments of the third statue had been rediscovered under the mud of the temple precinct. 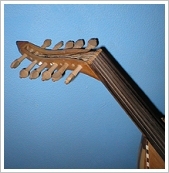 Since then they had been restored and recomposed. 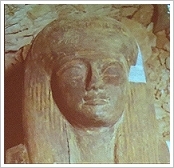 On 1st of March, 2012 the statue will be inaugurated followed by a scientific conference in which the restoration process will be explained. All in all, there were originally three couples of giant statues at Kom el-Hettan. The third one was made from alabaster and is "only" 11 metres high. (We covered the news of all the finds in our news 02/03/10, 22/03/10, 17/05/10, 02/10/10, 16/12/10, 27/04/11, 31/05/11). The lecture hall of the Mummification Museum was more than fully occupied when Susanne Bickel (University of Basel) gave her eagerly-awaited lecture. 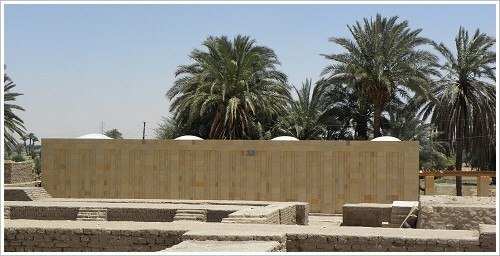 The concession of the Swiss mission applies to 11 non-royal tombs in the Valley of the Kings. 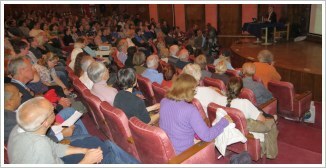 However, the audience came to learn more about the new found KV64. 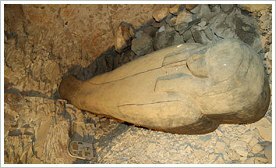 Exactly on 25th of January, 2011 the mission discovered the shaft which, as we know now, leads to the tomb of Nehmes Bastet. In those days the archaeologists had little hope for an important find. The shaft was too close to KV40 and seemed to be too small. They rather assumed that it would be about a deposit than a tomb, They covered and protected it with an iron gate - the Egyptian Revolution had started on the same day! - and waited nearly one year before they announced their find on 16/01/12. As the excavators continued their work they found the original blocking stones at the shaft's end in place, also at the entrance of the tomb. They found evidence that the tomb was originally built in the 18th dynasty and reused for a second burial in the 22nd dynasty. As usual in this time the burial was very simple without funerary goods like pottery or furniture. Beside debris there was just a 2 metre long sarcophagus with a mummy and a small stela which was still oriented to the mummy's face in the sarcophagus - therefore, the tomb had stayed completely intact! The mummy itself was nicely wrapped. Its examination will take time because it sticks on the coffin. The stela's back side shows Nehmes Bastet's name, the front side is beautifully coloured and shows Nehmes Bastet offering in front of Re-Harachte. 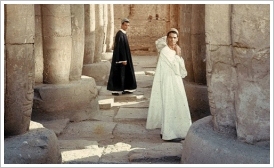 Next week's lecture will be on the Cachette of Karnak (19/02/12, 7pm). You weren't present last night? Then you've missed an really great event! The concert of the three young artists Hamada (oud = lute), Hussein (nay = flute) and Mohammed (darbuka = goblet drum) was a complete success. The sounds of their virtuosicly played instruments made every listener dreaming his very own dream of Arabian nights, desert or freedom. Do you know FarmVille? That's a farming simulation social network game, with which you can manage and cultivate your own virtual farm in real-time - just for fun. eZra3 goes the extra mile. Under that project you cultivate effectively a piece of farmland in Egypt - comfortably from home by so-called "Remote Farming". You select your own crops, monitor their actual growth via a web interface and eat them when they are harvested. Thereby eZra3 is committed to organic farming principles without chemical fertilizers or pesticides, genetically manipulated organisms, and tillage. Instead companion planting, biological pest control and succession planting are used in order to ensure a healthy diversity of plants and animals. Interested? 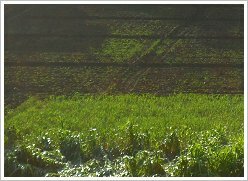 Then start the four-level project with a training program that simulates the growing of crops before you manage your real small piece of land with online guidance every step of the way. However, you make your own decisions based on the information given about character of the soil, types of crops, times of growing, temperatures, wind speeds, prices of seeds, costs of fertilizers and so on, which are provided to minimise your risk. You may choose between 52 crops, 28 perennial trees and 11 animals. The result: You cultivate your own farm, produce healthy food, and even help to reduce unemployment. Because someone somewhere de facto carries out your instructions! 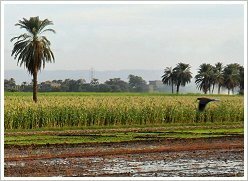 By the way: The average leasing cost of arable land in Egypt amounts to 3000 LE per feddan (= 0.42 hectare) per year. On 1st of February, 2012 one could read in the English edition of El Ahram (article on the opening of the Crocodile Museum in Kom Ombo) that the Merenptah Museum has been inaugurated recently. Unfortunately, this is not the case. The museum remains closed. 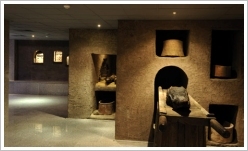 On Sunday, the 12th of February, 2012, 7 pm, the new found tomb KV64 will be the subject of the weekly lecture at the Mummification Museum in Luxor. Three weeks ago the discovery of the intact tomb in the Valley of the Kings had caused a sensation (see our news). BREAKING NEWS: Because of a time overlapping with the weekly lecture at the Mummification Museum the concert will already take place on Saturday, 11th of February, 7 pm! 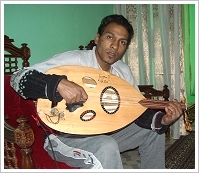 The Oud (ʿūd - عود, "wood") is a lute with a bowl-like back and a bent pegbox that was already used in Ancient Egypt for improvised ballads. 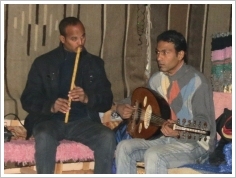 The Nay (nāy - ناي‎, "reed") is an end-blown flute made from a piece of hollow cane or reed, evidenced in Egypt since 3rd century BC. 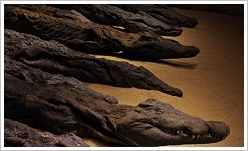 On Tuesday, 31st of January, 2012 Egypt's first Crocodile Museum was inaugurated by Antiquities Minister Mohamed Ibrahim. It is located directly in front of the Kom Ombo Temple, the opening was planned since last April (see our news). Out of 40 crocodile mummies having been unearthed in Aswan 22 of various sizes are arranged on a sand hill inside a huge glass showcase. Besides crocodile coffins and wooden sarcophagi, crocodile foetuses and eggs are on display as well as stelae and statues depicting the crocodile-god Sobek (3 exhibition pieces are borrowed from the Luxor Museum!). The most precious artefacts are gold and ivory teeth and eyes that had been inserted into the dead crocodiles following mummification. Interestingly, the minister mentioned according to Ahram Online that the Museum inside the Merenptah Temple also (re-)opened recently. We will follow it up!